The Great Cape Rescue is a tightly-woven fantasy adventure that moved along at a perfect pace. The protagonist, Finch, has three side-kicks named Kevin, Elliott and Rajiz that represent different ethic backgrounds and are very plausible in their suburban town. Finch’s parents are divorced, his father has remarried and has a new baby named Jake. Finch lives with his mother, sister and two ferrets and is adjusting to the divorce in a very realistic way. He loves his father, but is harboring confusion, anger and neglect, especially when it comes to his new baby brother. Finch is entering the 4th grade and is caught between growing-up and holding on to childhood. He realizes that he shouldn’t be playing superheroes with his friends anymore; however, he is not quite ready to give up his favorite childhood fantasies. All that changes when a cape that he bought at a garage sale when he was five suddenly comes to life. With the magic cape, Finch gets an idea to form the Society of Super Secret Heroes with his friends under the premise that they will only do good for others. The characters and situations portrayed in the novel are very realistic and sincere. Finch is unusually empathetic and really goes out of his way to help people and animals. Whether it is trying to make his new teacher feel more welcomed in his new school or being the best care-taker for the classroom’s hermit crabs, he tirelessly works to make sure that everyone’s happy. However, when it comes to his own needs, he is sometimes at a loss. Finch has encountered two bullies at school and his run-ins with them move the plot swiftly along. Even with the bullies, Thorn and Bud, Finch tries to understand what has caused them to behave the way that they do. After losing and then recovering the magic cape, Finch realizes that true strength lies within and that it is up to you to believe in yourself. The novel leaves the reader wanting to read about more of Finch and company’s next mission. Anyone picking up The Great Cape Rescue expecting a book about superheroes is going to be tremendously disappointed. It’s not about superheroes. It’s about a cape with telepathy and middle-school hijinks.The Great Cape Rescue is a decent book. It’s not amazing, but it’s a cute story. Someone, however, missed the boat in trying to make it a “superhero” story. It’s not. Sure, a group of friends get together and call themselves superheroes, but there’s nary a superpower in sight. I kept waiting (and the book kept teasing that the cape might have some sort of extraordinary ability), but nothing.It’s actually to the book’s detriment to try and tie superheroes into the story. There’s enough going on that the book would have been just fine without the forced superhero angle. Quasi-recommended. Finch and his 3 friends (Elliott-the prankster, Raj-the magician and Kevin-the artist) are now in fourth grade and feel their days of pretending to be superheroes are done. However, Finch hears a voice in his head telling him to create a secret society of super heroes. The voice turns out to be an old superhero cape Finch has had since kindergarten. With the Thinking Cape's help, the boys together stand up against some class bullies, help rebuild a former friendship, and help their new teacher make friends at school. But when their magical cape disappears, can the boys still be superheroes and rescue Thinking Cape? A funny read about the power of friendship and realizing we can all be superheroes (even without a cape). A good message but, maybe it's just me being 24 and not exactly the target audience for this book, it was a little corny and boring. I get the whole "non-violent use our brains instead of our fists" idea but it doesn't make for a great story in this case. There's no action. I wouldn't recommend this to most children. I liked the story and message of this book. The premise behind it seemed a bit corny to me, but then, who among us has not tied a towel around our neck and pretended to fly!? The characters are really well developed in this simple story and there are some good lessons taught about solving problems with bullies, separated parents, siblings, and all of those elementary school friend issues. VERY clever premise! Slightly nerdy guys who played super heroes as little boys now realize they are too old for this game as they are entering 4th grade. When one of the gang starts to get rid of his cape, he realizes it can communicate with him, and provide "super hero" help with school and home problems. Sweet and funny. Finch and his friends had always played superheroes together. But now that they were beginning 4th grade together, they decided it may be best to abandon their game. That all changed when Finch realized his superhero cape could communicate with them! Some really bad editing! But the basic story was pretty good. We were disappointed to see there isn't any sequel. Great to book talk to 4th and 5th graders - HIGHLY enjoyable! 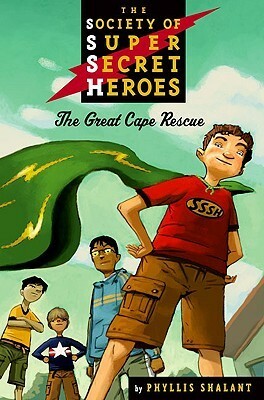 "The Great Cape Rescue (The Society of Super Secret Heroes, Book 1) by Phyllis Shalant (2007)"
Beginning can be boring but in the middle and end it keeps you guessing! Phyllis Shalant - Even before I could read or write, I was making up stories in my family's apartment in Brooklyn, New York. I'd sit under the kitchen table with my dolls and stuffed animals, and pretend the table and chair legs were a forest. Some days, the dolls would hide in the "trees" and the animals would stalk them. On other days, the animals would be gentle creatures that helped the dolls find their way home. When I wanted a winter adventure, I'd take my little cast into the bathroom and shut the door. There, the sides of the white tub became a snowy mountain for the dolls to climb, and the toilet, an icy mountain lake. (I have to admit that sometimes the dolls fell in. )What I wanted more than anything in those days, was a dog. But we lived in a tiny apartment on the fourth floor of a building that didn't have an elevator. So my mother bought me a little red-eared turtle instead. Before long, my turtle became an actor in my stories. Back under the table, I'd build block houses for it to crawl through. Or else it would join the dolls in the bathroom where it swam with the bath toys. And sometimes, it rode on the back of the taxidermied alligator (really a camen) that my aunt in Florida sent for my sixth birthday.When I got to fourth grade, I could finally write fast enough without getting hand cramp to put my stories down on paper. My turtle got to retire to its bowl on a sunny windowsill. And I began writing stories like crazy. I kept it up all the way through my school years.After college, I tried several different careers related to writing. I taught high school English, wrote advertising copy, and did some reporting for a local newspaper. But when I finally started to work on my first novel, The Rock Star, the Rooster, & Me, the Reporter, a wonderful thing happened. I felt the same, awesome sense of being totally immersed in my imagination that I'd experienced under the kitchen table all those years ago. I never want to lose that feeling again.Today I spend most of my time writing in my studio at home. I also make author visits, and teach writing children's literature in a program at Manhattanville College. I live in White Plains, New York with my husband, our dog, Kristi, and a red-eared turtle named Bartleby. Our two grown daughters, Emily and Jenny, visit us often.